« Dunbar’s Number: Why My Clients Hire Me? When I lived in Stockholm, I was responsible for customers throughout Scandinavia. One of my favorite customers was Dale of Norway, the creators of richly patterned, thick wool sweaters. 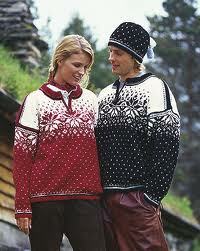 The sweaters are very popular with winter sport enthusiasts in my home state of Colorado. They’re stylish and they’re practical … and therein lies a tale. There are a couple of lessons here. First, sometimes a satisfied customer is just that: satisfied. I was a very satisfied Dale of Norway customer. If you did a customer satisfaction survey, I would be right at the top. But I was generating exactly zero revenue for the company. One of Dale of Norway’s challenges was to overcome the satisfied customer curse. They needed to give me (and even my wife) more reasons to buy. To complement their heavy weight sweaters, they introduced two new product lines — mid-weight sweaters and lighter weight accessories. I’m now the proud owner of a mid-weight sweater and some long underwear. I’m still satisfied but, more importantly, I’ve generated new revenues for Dale of Norway. The second lesson: different people buy for different reasons. Don’t ever assume that what’s sauce for the goose is sauce for the gander. To the maximum extent possible, live with your customers. When you see the world through their eyes, you’ll find that different groups see your product differently. There’s nothing surprising in that — it’s just segment marketing. Unless you understand how each segment thinks, you’ll never communicate effectively with them. One message does not fit all. The third lesson? Dale of Norway makes great sweaters, gloves, mittens, and scarves. So get out there and buy one … or two … or three. You can find them here. 4 Responses to Branding: Why Do They Buy? Interesting points — part Mars/Venus with a good dose of market segmentation and product management … I’m thinking some contemporary tools that compel customers to engage more closely have been leveraged as part of their success formula, likely spawning some of the tactics to help mitigate the ‘satisfied customer’ impact. On the hard goods side, it would be interesting to do an in-depth study on the influence of customer satisfaction on the revenue generated by Craftsman hand tools over the last several decades, noting that they rolled out a less expensive/lower quality/limited warranty alternative line back in the late 90’s … perhaps a reaction to score revenue in lieu of persisting the free replacements related to the vanguard line? With the earth warming, Dale of Norway will have another reason to add to its product line. And I will have another reason to buy. You’ll have another reason to buy … but are you buying it for fashion or for utility?